Yen Ta Fo has its roots among the Chinese immigrants. 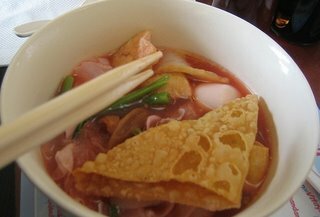 Yen Ta Fo is Thai Seafood noodle famous in Thailand. This menu is easy for cooking. - 1 tbs. morning glory, cut into 2 inch long pieces, boiled. 1. Soak the rice noodles in warm water until tender. Boil for 3-5 minutes. Then, remove. Put vegetable oil over the noodles, and quickly stir so that the noodles will not stick together. 2. In a pot, boil tofu in the water. Then season with salted soybean paste, light soya sauce and sugar. 3. When serving, place the noodles in a serving dish and pour the soup over it. Season with light soya sauce, sugar, chilli powder, and vinegar as desired. Yen Ta Fo is as simple or complex as you want it to be. Rice noodles are wonderful- thanks for sharing!